He passed away, having been poisoned, in Afughal, in the second prostration of the Dawn prayer’s first cycle, on 16 Rabi` I, AH 870 . He was buried after the Midday prayer on the same day, in the middle of the mosque he had set up in that locality. I have read in someone’s handwriting that he left no son behind. Seventy-seven years after his death, his remains were moved from Sus to Marrakech. They buried him in the ‘Arus Gardens and a mausoleum and shrine were built over his tomb. When they exhumed him from his noble grave in Sus, they found him in the same state in which he had died, so they decided not to throw any fresh earth over his corpse. Throughout the intervening time, his conditions were unaltered, and the trace of the shave on his head was exactly as it had been on the day of his death, as if it had only recently been shaved. One of those present placed his finger on his noble forehead, holding the skin back from what lay underneath, and when he lifted his finger the blood returned to the spot, as it would happen to a person who is still alive. 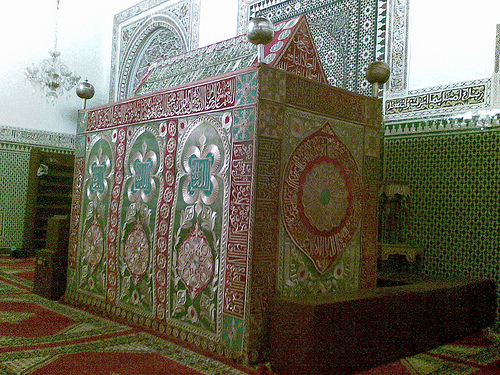 His tomb in Marrakech is enveloped by a tremendous majesty, a shining light, and a manifest force. People congregate around his noble grave and read the Dala’il al-Khayrat over it, while the fragrance of musk exuded from his tomb pervades the mosque entirely. He spoke at length about Sufism, penned fine ghazals and was bestowed truthful spiritual states. He would say: ‘My Lord said to me, “My slave, I have preferred you over My entire creation by the abundance of your prayers over My Prophet.”‘ The author of Mumti’a al-Asma’ said, by way of clarification: ‘What is meant is His preference for him over His other creatures of his age’ Unequivocal signs, in fact, appeared in him. He had the best of students whose number exceeded twenty thousand, and who transmitted Prophetic hadith and sayings about the spiritual path and Sufism from him. He had taken the lofty Shadhili Path from his mentor, the knower of Allah Most High, our master Abu ‘Abdullah Muhammad Amghar. He taught him facets of Sufism that would dazzle intellects and unlocked recondite and ambiguous aspects associated with it, as a result of which he became one of its luminaries. Among the prominent disciples who took the path from him was the complete ghawth, the radiant proof, our liege and master Abu ‘Abdullah Muhammad b. ‘Abd al-‘Aziz b. ‘Abd al-Haqq known as al-Tabba`. He was a supreme succour who encompassed the secrets of the folk of ultimate reality. He was a notable scholar endowed with virtue and beneficence, and who made peculiar statements on the sciences and allusions of the Sufis. A mausoleum that draws visiters was built over his remains, becoming hub for people of virtue and the spiritually elite. He is one of the seven axial saints buried in the city of Marrakech and from its spiritual fotresses. O Allah, benefit us through Your righteous Friends, and pour their spiritual sustentations over us at all the times, amin. See his biography in al-A’lam (6/151), Tabaqat al-Shadhiliyyat al-Kubra by Muhyi al-Din al-Tu`mi (p. 193), al-Khazanat al-Taymuriyya (3/59), Shawariq al-Anwar, which names him as Muhammad b. ‘Abd al-Rahman b. Sulayman, al-Qadi’s al-I’lam bi man Halla Marrakush wa Aghmat min al-A`lam (4/57-122), which reads: ‘Al-Jazuli or al-Juzuli with either the fath or the damm’, while al-Dhayl wa al-Takmila by lbn `Abd al-Malik al-Marrakushi refers to him al-Quzuli with a Qaf. It is said that in the Berber language it is pronounced Kuzuli. As for his other noun of ascription al-Simlali, it is an ascription to Simlala, one of Jazula’s tribal groupings. Muhammad b. Ahmad b. ‘Ali b. Abi’l-Mahasin Yusuf al-Fasi reports various reports on the date and year of his passing in Mumti’a al-Asma’ fi Dhikr al-Jazuli wa al-Tabba’ wa Ma Lahuma min al-Atba’. According to one opinion, he passed away on 4 Dhu al-Qa`da AH 869. His full name is Abu Abdullah Muhammad Ibn Suleiman Ibn Abi Bakr Al-Jazuli Al-Simlali and was a descendant of Prophet Muhammad, praise and veneration be upon him, via his grandson Hasan, son of Ali, may Allah be pleased with them. Al Jazuli belonged to the Berber tribe of Jazula that settled in the Sus area of Morocco which lies between the Atlantic ocean and the Atlas mountains. The date of his death is uncertain, however it occurred between the years 869-873 AH as he offered an obligatory prayer. In the Encyclopedia of Islam, 1957 Leiden, it is reported that seventy-seven years after his death his body was exhumed for reburial in Marrakesh and that his body had not decomposed. He a descendant of the Prophet, Allah’s blessings and peace be upon him He belonged to the Berber tribe of Jazula which was settled in the Sus area of Morocco between the Atlantic Ocean and the Atlas Mountains. 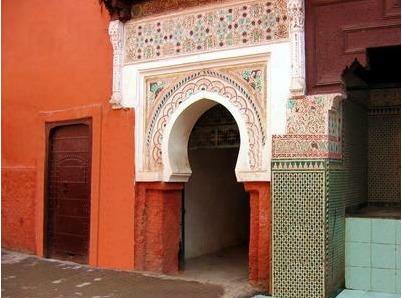 He studied locally and then went to the Madrasat AS-Saffareen in Fez where his room is still pointed out to visitors. After setting a tribal feud he left the area and spent the next forty years in Mecca, Medina and Jerusalem. After this, he returned to Fez where he completed Dala’il al-Khayrat. He was initiated into the Shadhili Tariqa by Sharif Abu Adullah Muhammad Ibn Amghar. He spent forteen years in Kbalwa (seclusion) and then went to Safi where he gathered around him many followers. The governor of Safi felt obliged to expel him and as a result, Imam Jazuli called down Allah’s wrath on the town and it subsequently fell into the hands of the Portugese for forty years According to a tradition, it was the governor of Safi who poisoned Jazuli and caused his death, whilst engaged in prayer, in 869 H (or 870 or 873) Seventy seven years after his death his body was exhumed for removal to Marrakesh and found to be uncorrupted (adapted from The Encyclopaedia of Islam, 1957 Leiden). It is said that the writer of Dala’il al-Khayrat once went on a journey , when in great need of water for making ablutions. he came upon a well but could not reach the water without a bucket and rope which he did not have. He became very worried . A young girl saw this and came to his assistance. She spat into the well whereupon the water rose to the top of its own accord. Seeing this miracle, he asked the girl ” And how is that possible?” The replied “I was able to do this through my asking for blessings upon the Prophet, Allah’s blessings and peace be upon the him.” Having thus seen the benefit of asking for blessings upon the Prophet, Allah’s blessings and peace be upon him , he decided to write Dala’il al-Khayrat. الإمام الرباني، والقطب الصمداني، الفردُ الكامل في المحبَّة الذاتية، المحقّقُ الجامع لكمالات الولاية المحمدية، مسندُ أهل الإرشاد والهداية، مرشد المريدين وموصلهم إلى طريق أهل الحقائق العلية، زبدةُ العارفين، وقدوة المحققين، غوث الأولياء، وسُكُرْدان الأصفياء، من سارت بذكره الركبان، واشتهر صيته في سائر البلدان، مولانا الإمام الفاضل، الكامل العارف الواصل، قطب زمانه، وفريد دهره وأوانه، مولانا الشريف أبو عبد الله محمد الجُزُولي السملالي الحسني الشاذلي بن مولانا عبد الرحمن بن مولانا أبي بكر المرتضى بن مولانا سليمان بن مولانا سعيد بن مولانا يعلى بن مولانا يخلف بن مولانا موسى بن مولانا يوسف بن مولانا عبد الله بن مولانا جندون بن مولانا عبد الرحمن بن مولانا حسان بن مولانا إسماعيل بن مولانا جعفر بن مولانا عبد الله بن مولانا أبي محمد الحسن سبط النبي صلى الله عليه وسلم وريحانته. توفي رضى الله عنه بأفوغال مسمومًا في صلاة الصبح، في السجدة الثانية من الركعة الأولى سادس عشر ربيع الأول عام ثمان مئة وسبعين، ودُفن لصلاة الظهر من ذلك اليوم بوسط المسجد الذي كان أسَّسه هنالك. ووجدت بخطِّ بعضهم أنَّه لم يترك ولدًا ذكرًا. ثم بعد سبع وسبعين سنة من موته نُقل من سوس إلى مراكش، فدفنوه برياض العروس منها، وبُني عليه ضريحٌ ومقام، ولما أخرجوه من قبره الشريف بسوس وجدوه كهيئته يوم دفن، لم تعد الأرض عليه، ولم يتغير طول الزمان من أحواله شيءٌ، وأثر الحلق على تنار رأسه كحال يوم موته، إذ كان قريب العهد بالحلق، ووضعَ بعض الحاضرين أصبعه على وجهه الشريف حاصر الأدم عما تحتها، فلما رفع أصبعه رجع الدم كما يقع ذلك في الحيِّ. وقبره بمراكش عليه جلالةٌ عظيمة، ونور ساطع، وسطوة ظاهرة، والناس يتزاحمون على قبره الشريف، ويقرؤون «دلائل الخيرات» على قبره، ورائحة المسك تخرجُ من قبره، حتى عطرت رائحة ذلك العطر المسجدَ بأسره. وله رضى الله عنه كلامٌ كثير في التصوف، وتغزلات رقيقة، وأحوال صادقة. وكان يقول رضى الله عنه: قال لي ربي: يا عبدي، إني فضَّلتُك على جميع خلقي؛ بكثرة صلاتك على نبيي. قال صاحب «ممتع الأسماع»: أي الذين في عصره. وظهر منه ما لا يخفى. وكانت له تلامذة أخيار، تنوف عشرين ألفًا، ينقلون عنه الحديث، وكلامًا في الطريق والتصوف. تلقى رضى الله عنه الطريقة الشاذلية العلية من شيخه العارف بالله تعالى مولانا أبي عبد الله محمد امغار، فأتى فيها بما يُبهر العقول، وحلَّ غوامض مشكلاتها حتى صار من الفحول. ومن أكابر أصحابه الآخذين عنه الطريق الغوثُ الجامع، والبرهان الساطع سيدنا ومولانا أبو عبد الله محمد بن عبد العزيز بن عبد الحق المعروف بالتَّباع، وكان رضى الله عنه غوثًا جامعًا، ولأسرار أهل الحقيقة والشريعة شاملًا، كان من العلماء الأعيان، ومن أهل الفضل والإحسان، وله كلام غريبٌ في علوم القوم وإشاراتهم، شهرته في بلاد المغرب تُغني عن وصفه، توفي رضى الله عنه بحضرة مراكش عام تسع مئة وأربعة عشر، وله مقام وضريح يزار، مورد أهل الفضل والأخيار، وهو أحد السبعة الأقطاب، المدفونين بحضرة مراكش، المرابطين بها، اللهم انفعنا بأوليائك الصالحين، وادرر علينا من إمداداتهم في كل وقت وحين. آمين. () محمد بن سليمان بن داود بن بشر الجزولي السملالي الشاذلي: صاحب «دلائل الخيرات» من أهل سوس المراكشية ولد سنة 807 هـ. تفقه بفاس، وحفظ «المدونة» في فقه مالك، وغيرها. وحج وقام بسياحة طويلة. ثم استقر بفاس. وكان أتباع يسمون (الجزولية) من الشاذلية، ومات مسمومًا فيما يقال بمكان يدعى (أفغال) سنة 870 هـ [«الأعلام» (6/151)].